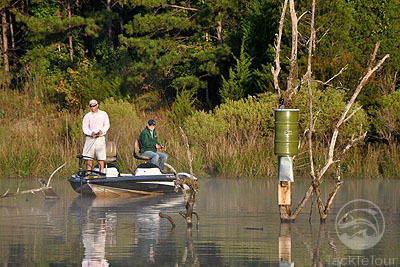 Introduction: The team heads to Alabama to fish alongside East Coast dealers as Shimano showcases their newly released Curado and Citica E reels. At the same time we learn about the exceptional bass fishing at Dream Lake Lodge in Livingston. 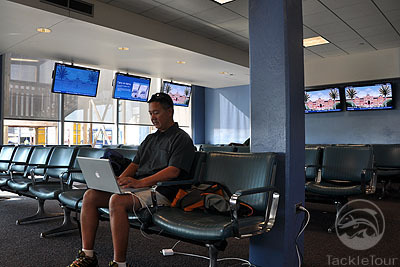 We set out on our trip flying from the West Coast to Birmingham Alabama, a flight which had one stop in Chicago. From Birmingham we drove East to Livingston, which is about a one and a half hour drive. 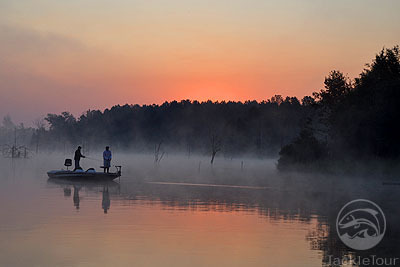 Anglers can also fly into the smaller city of Jacksonville, but the drive is just about identical. When we arrived at the Dream Lake Lodge it was well after dark and after a full day travelling and we were met by the team at Shimano and Chad Bracknell, son of Paul and Connie Bracknell, the owners of the property. There wasn't much we could see at night but we were able to head down to the boat dock directly flanking the lodge to check out the boats we would be fishing out of in just a few hours. The lodge has fourteen 21 foot Stratos bass boats, and we immediately noticed that the outboards on all the boats were missing, and in their place a rudder. Power on all of these boats is courtesy of Minn Kota Maxxum foot controlled trolling motors. Chad explained that the lakes are small enough that trolling power is more than enough, and there were also no electronics on the boat as the fish spook with electronics on. He also explained that the boats were all specially weighted down because like any other bass boat they are designed to be mounted with a heavy outboard, so all of their boats were specially weighted down so they would be perfectly stable without an outboard. 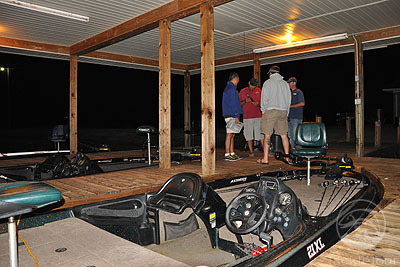 We would have to wait until sunrise to get on the water, but we maximized the time by swapping stories with the team at Shimano and prepping our gear. Just before sunrise Chad gave us the background on Dream Lake. His family was once in the tackle business, running a retail store in town. It was in this shop that Chad literally spent his childhood growing up around tackle and fishermen. During this period his father Paul decided it was time to do something new, and dreamt about creating a premier sporting destination for both fishing and hunting. Putting it all on the line he purchased some land and began creating Dream Lake. 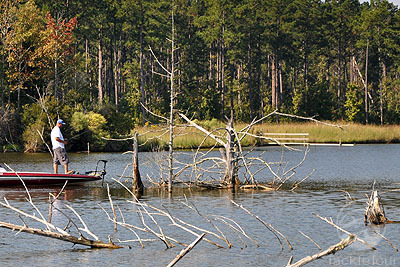 The original Dream Lake was completed in 1990, and anglers could visit the lake for a day and pay to fish. 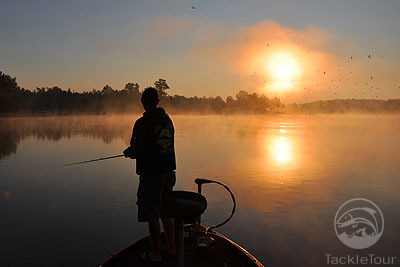 It started to gain fame as a destination for trophy bass and soon word spread as TV shows starting showing up to film on the productive lake. 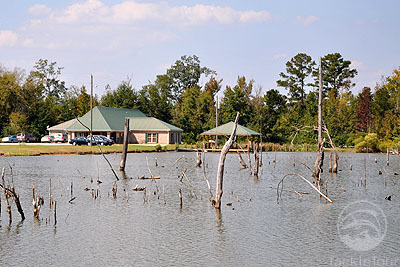 Today there are two lakes on the property, the original Dream Lake I which is 77 acres, and Dream Lake II which was completed in 2000 is 50 acres. To accommodate out of town anglers looking for a overnight or even weeklong getaway the family constructed a lodge on the bank of Dream lake II. These lakes are not large by any means, but they are managed beyond belief. 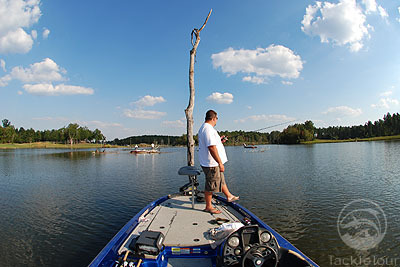 Both lakes are continually fertilized and stocked with Florida strain Bass, Blue Gill, Coppernose bream, Thread Fin Shad, Tilapia, and Crawfish. Dream Lake I & II have 100's of rock piles, flooded timber, ledges and ditches. Dream Lake I has 19 underwater aerators, Dream Lake II has 12 underwater aerators. 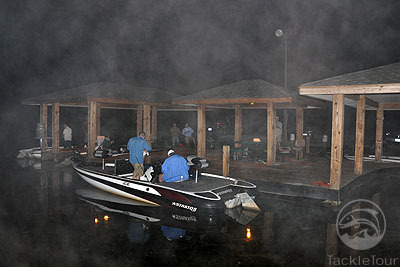 Both Lakes have depths up to 25 feet deep and each lake has a dock with covered boat slips that have power and water. With the sun about to come up it was finally time to go fishing. Zander fished the first day with Jeremy Sweet, Shimano's Reel Product Manager, while Cal was paired with Justin Poe, Shimano's Rod Product Manager. Both of the Shimano guys had come out early and fished with other dealers during the week, and already knew the productive spots. The lures that were working were Texas and Carolina rigged worms, poppers, shallow cranks, buzzbaits, and spinnerbaits. Thus far nobody had really tried fishing swimbaits and jerkbaits and spooks were seemingly ineffective. We started the first day on Dream Lake I, and within minutes of launching it became clear why the name of the lake was appropriate. Even before the fish were hitting we marveled at the incredible scenery on the lake. 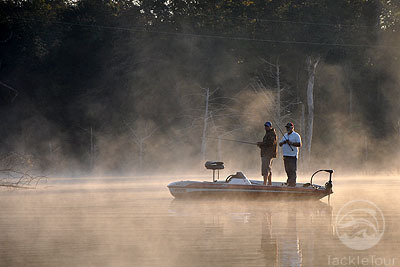 A morning on Dream Lake looks just like you did a nosedive into the pages of your favorite fishing magazine. With the combination of warm water and cool air the mist off the surface of the lake was for lack of a better word....dreamlike. 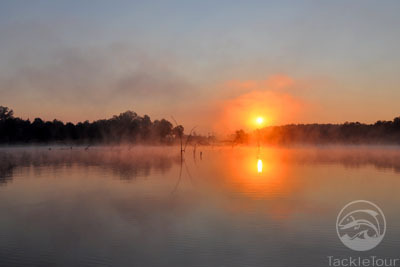 The moisture in the air created a surreal sunrise and as hundreds of Swallows descended on the lake at sunrise we knew this was going to be a rare experience. We started out fishing the edges opposite of the launch ramp and Jeremy motioned to cast towards the bank. 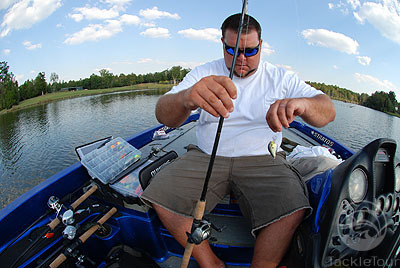 "The tighter you can drop your lure the better, these fish seem to be holding real tight to shore, and on this lake there is structure everywhere." 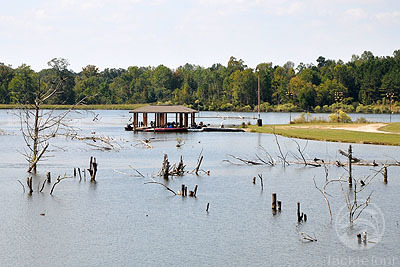 Jeremy wasn't kidding either, Dream Lake (both of them) have incredible amounts of fish holding structure in the form of submerged trees, flooded timber, ledges, ditches, rock piles, and aerators. We were catching fish on every fifth cast, and all of them were between the two and three pound cast when we heard what sounded to us like a bunch of pebbles being tossed into the water. "What the heck was that?" Zander asked. "That's the feeder," Jeremy replied. "It goes off then the next one down the line will go in eight minutes, there are a lot of fish that hang out underneath the feeders, a lot of carp too." The carp were originally introduced to the system top help balance out the ecosystem but many had been conditioned to simply hover underneath the feeder, and would go into a frenzy as the food is released. Bass compete for the food as well, and every time a feeder would go off the area would come alive with fish breaking the surface. Fishing directly beneath the feeder didn't seem that effective, but fishing in the surrounding area yielded many strikes. While all of us were catching fish Shimano Customer Service and Forum Support Dan also known as Bantam1 on our forum was schooling everyone. He was killing us on both numbers and quality and had the lake patterned. He was fishing mainly plastics, but the key was he knew where to find the fish. Working real tight on structure Dan pulled twice as many fish as we did no more than 100 feet away. Thinking it was time to mix it up Cal turned to his strength...swimbaits. It didn't matter that they hadn't been proven during the week, it was the way that he wanted to catch the fish. Justin didn't seem to mind and positioned the boat alongside some submerged timber. Zander and Jeremy were about 300 feet away when the screaming began.